ALMOST 5,000 children visited Northern Ireland’s prisons during 2013, according to new figures released to The Detail. Over 25,000 child visits were recorded by the Northern Ireland Prison Service over the 12 month period – 20% of the total visits to our prisons. Some children visited just once, while others entered jails multiple times. We have not been told the relationship the 4,865 individual children had with the prisoner they were visiting but it is likely many had – and could still have – a parent serving a sentence in Magilligan, Maghaberry or Hydebank Wood jails. Children’s charity Barnardo’s Northern Ireland has described children with a parent in prison as the forgotten victims of crime. Research has shown that children with a parent in prison experience a range of poor outcomes in relation to well-being, education and relationships. Having a parent in prison can leave children more vulnerable to spending time in prison themselves as adults. Prisoners who maintain contact with their families are less likely to reoffend. Today, in the first of a two part series, The Detail reports on the latest figures relating to child visitors to our prisons. The comprehensive data we received from the prison service in response to our Freedom of Information request includes a home postcode breakdown of the children who visited the three prison sites last year. 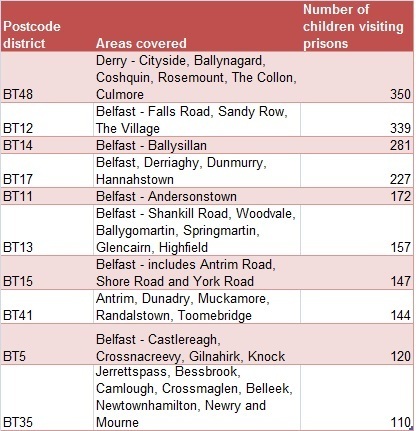 This shows that BT48 in Derry – which includes the Cityside, Ballynagard, Coshquin, Rosemount, The Collon and Culmore areas – was the postcode area in Northern Ireland with the highest number of resident children visiting our prisons. A total of 350 individual children from this area visited jails last year. This was followed by BT12 in Belfast (Falls Road, Sandy Row and The Village) where 339 children who visited prisons lived. The Families Matter programme involves male prisoners who are parents signing up for a 17 week programme of activities with a focus on family life and family relationships. Practical classes include the men learning how to support their children’s learning in school, managing a family budget and cooking healthy meals. At all times they are encouraged to think about the impact of their choices and decisions on their family. Participating prisoners, who must remain drug free throughout the programme, also take part in an extra child-friendly monthly visit with their families. The Detail has visited Maghaberry Prison to speak to prisoners about the scheme and the impact a prison sentence has on their relationship with their children and partners. Justice Minister David Ford told The Detail that maintaining family life helps to reduce inter-generational offending. On a daily basis across Europe, it is estimated that 800,000 children live separated from their parents due to them serving time in prison. We requested detailed data from the Northern Ireland Prison Service on child visitors to Northern Ireland’s three prison sites – Maghaberry, Magilligan in Limavady and Hydebank Wood in Belfast. Maghaberry Prison houses adult male long term sentenced and remand prisoners. 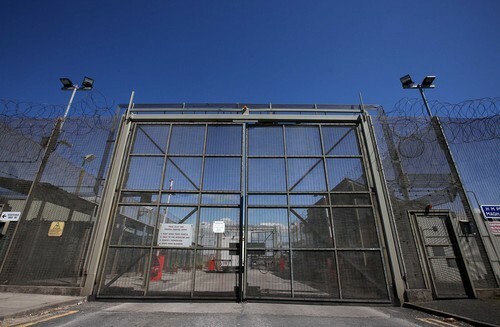 Magilligan Prison in Limavady is a medium to low security prison for male prisoners with six years or less to serve who meet the relevant security classification. Hydebank Wood Prison and Young Offenders Centre in Belfast accommodates all young male offenders aged between 17 and 21 years on conviction serving a period of four years or less in custody and all female prisoners including young offenders. The data we requested and received includes a breakdown of total visitor numbers each month of 2013 for each prison; how many of these visitors were adults and how many were children and whether these visitors attended once or more than once during the year. These figures were taken from PRISM – the Prisoner Records Information System Management. Visits are all attended domestic and professional visits and a child is defined as being aged under 18. We also asked for more detailed information on the children who visited the prisons last year. We were given a breakdown by gender, prison visited and the child’s partial home postcode. Only the first four digits of the postcode were provided to prevent home location by street being identified. No individual child can be identified by the data. We asked the NIPS how many prisoners in the latest annual prison population had parental responsibility for children but were told that the prison service does not collect information on a prisoner’s parental responsibility for a child or children. The data released by the NI Prison Service shows that 4,856 individual children visited Northern Ireland’s prisons during 2013. Of these children, 1,976 visited jail only once and 2,880 visited more than once. A total of 2,695 young people visited prisoners in Maghaberry, 1,218 visited Magilligan and 943 went into Hydebank Wood. Twenty percent of the total 126,505 visits to Northern Ireland’s prisons in 2013 were by children (25,031). The individual children were fairly evenly split in relation to gender – 2,188 females and 2,667 males. In just one case the gender was unrecorded. Click here to see a monthly breakdown of visits to each prison in 2013. The postcode data provided by the prison service enabled us to map the home postcode district of 4,605 of the 4,856 individual children who visited Northern Ireland’s three prison sites during 2013 – some have a home address outside of Northern Ireland. Children missing from the map had an incomplete or no postcode recorded. We have withheld any number in a category which is less than five children to ensure individual children are not identified. Click on the map above this article to examine these figures in detail. The postcode area with the highest number of resident children visiting Northern Ireland’s prisons was BT48 in Derry (350 children). Of these children, 140 visited Maghaberry, 132 went into Magilligan and 78 travelled to Hydebank Wood in Belfast. This was followed by 339 children from BT12 in Belfast (Falls Road, Sandy Row and The Village) – with 184 visiting prisoners in Maghaberry, 77 going into Magilligan and 78 to Hydebank. See the table below for the 10 postcode districts with the most children visiting prisons here. Outside of Belfast, it includes postcode districts in the areas of Antrim and Newry. Deirdre Sloan is manager of Barnardo’s NI Parenting Matters service which provides child-centred support, information and parenting programmes for parents in prison. She said: “Children with parents in prison can be the forgotten victims of a crime. “Research shows they are likely to be at higher risk of poorer educational outcomes and can also suffer mental and physical health problems. Mrs Sloan said that studies have also shown that children who have close ties with their parents while they are in prison tend to cope better than those who have no contact and where a positive and consistent parent/child relationship is maintained the outcomes are significantly higher. Barnardo’s NI has been working in Northern Ireland’s prisons for over 20 years with a range of parenting programmes aimed at maintaining contact and supporting parent/child relationships. This includes the Families Matter programme at Maghaberry Prison – which we will report on in depth next week. We asked Justice Minister David Ford what he thought of the child visitor data and also how well Northern Ireland’s prisons cater for children. The Minister said: "Northern Ireland Prison Service (NIPS) has been working with the children and families of offenders for many years. “Through statutory and voluntary partnership working, positive parenting techniques are developed which are aimed at increasing the stability of a child’s life during and after parental imprisonment. Mr Ford said that the prison service recognises that maintaining family life can have important benefits for all prisoners. He continued: “It is considered an integral part of effective resettlement, helps prevent re-offending and contributes to the reduction of inter-generational offending. “The positive influence that the support and guidance of family members can have on a prisoner cannot be over-estimated. Our report and videos on the family visit to Maghaberry – click here.